Burnt Toast? The Hudson Cafe outshines a local brunch spot. The Woodward Spine would like to welcome our newest contributor, Emily Fields. Emily is a student at Wayne State University studying Political Science. She currently works at Goldfish Swim School in Birmingham. Emily enjoys reading, taking her dog, Tucker, on walks, trying new restaurants and anything to do with the band Oasis. Entering round 200 of the “Where to eat?” game, Jeff suggested The Hudson Cafe. I had never heard of this eatery; he had read about it in a local paper. Before deciding to head downtown, we Googled the menu. One glance and we knew that this was a serious brunch spot. 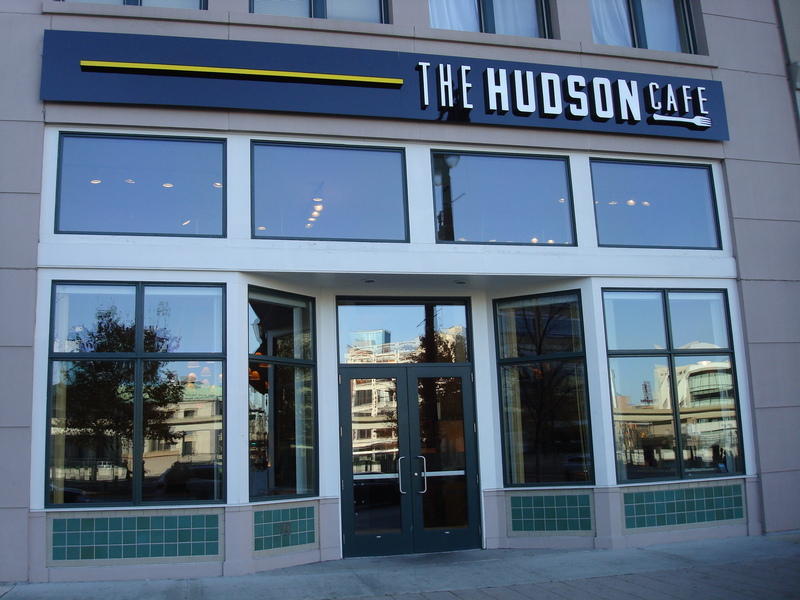 The Hudson Cafe is located right on Woodward between Grand River and Gratiot/State. Its exterior is clean and simple. The first thing you notice once you enter is the “Cafe Bar”, situated to the right of the entrance and the hostess stand. The bar serves various coffees and treats. I thought this aspect was charming – it seems to cater more to the morning business crowd grabbing a quick breakfast before heading to the office. Moving on toward the dining room, you notice how bright the room is. The colors are soft and light, the ceilings are high and the floor to ceiling front windows sends sunlight streaming in. While there are several TVs, they are neither the focal point of the walls they are on, nor are they obnoxious. The lighting is a great feature of the decor; track lighting behind the bank of couch seating along the wall is spot on as are the sconces on the walls. Now, the food. The waitress handed us over the menus, which were streamlined and easy to read, and we were immediately excited. Every option sounded delicious, and every dish that we saw pass looked wonderful. The menu absolutely reads brunch. It features a pancake section, a French toast section, an omelet section, and eggs benedict section, a sandwich section and a healthy options section. Jeff was drawn to their red velvet pancakes, which the waitress said is by far the most popular item on the menu. It took me a while longer, but I chose to have a traditional eggs Benedict. A little sweet, a little savory. Once arrived, the dishes were beautiful. In full disclosure, I watch a lot of cooking shows. I know how obsessive people can be over presentation. For me, it’s more about the food. But the presentation of our brunch was perfect. The colors were great, the details were pretty and neither of us could wait to dig in (I find this to be the most important aspect of presentation!). The Hudson Cafe had me at first bite. The eggs benedict was wonderful. The eggs were perfect – cooked but runny, which made the English muffin soggy and delicious. 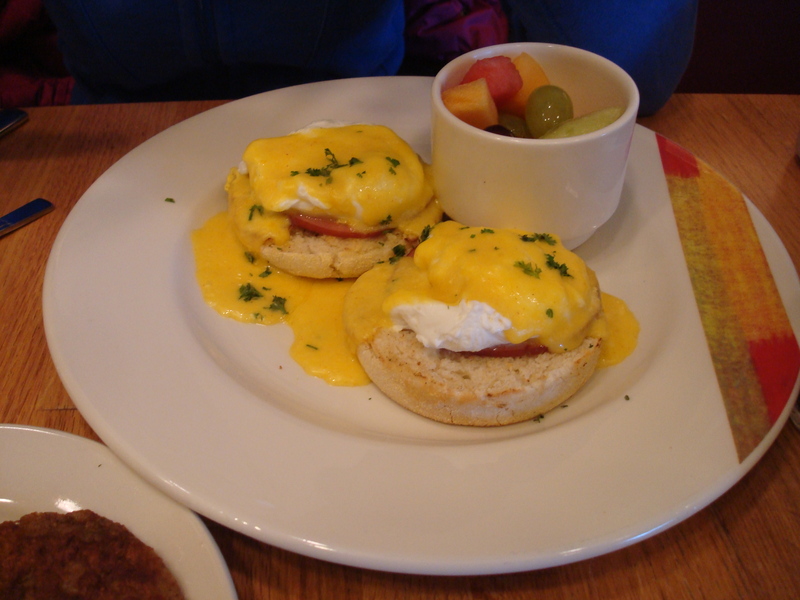 The Canadian bacon was a great partner to the eggs and muffin and the Hollandaise was awesome. Jeff’s red velvet pancakes were more of a desert, but they were to die for. 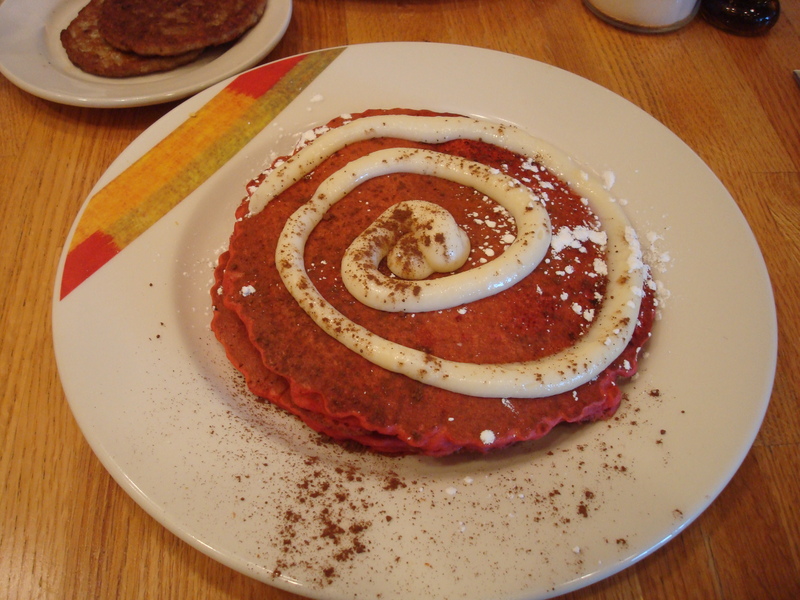 The pancakes were red and fluffy, with a cream cheese topping. These pancakes are a cool take on the traditional Bisquick and syrup. Even the coffee was delicious! The Hudson Cafe experience was excellent. The service was great, the atmosphere is relaxed and the food is stellar. The motif echoes that of another popular brunch (and more) spot, Toast. Up until this afternoon, I thought Toast had the best brunch in town. I always enjoyed the recipes they have to offer and found the vibe to be cool. However, after I experienced The Hudson Cafe, I have moved on to a new love. The Cafe blows Toast out of the water. The clean and simple vibe is much more conducive to enjoying your food than the kitschy, mismatched vibe of Toast with its bold wallpaper and funky dishes. I am much more satisfied and intrigued with the menu at The Hudson Cafe. Another positive about the Cafe is that it knows what it is. It is a brunch spot, so they serve breakfast foods and a couple of lunchier options. Toast seems to be confused, with its liquor license and extensive menu covering brunch through dinner. For me, a brunch place is a brunch place, not a brunch place at noon and dinner at 7. Toast is burnt, The Hudson Cafe is fresh and fun. Bottom line: The Hudson Cafe is a must, whether you’re downtown or make this place a destination. This entry was posted in Detroit, Food, Things To Do and tagged breakfast, brunch, detroit, Food, new, woodward. Bookmark the permalink. 1 Response to Burnt Toast? The Hudson Cafe outshines a local brunch spot.